@ItzMercy's recent post... the "Best faction to paint pink??" 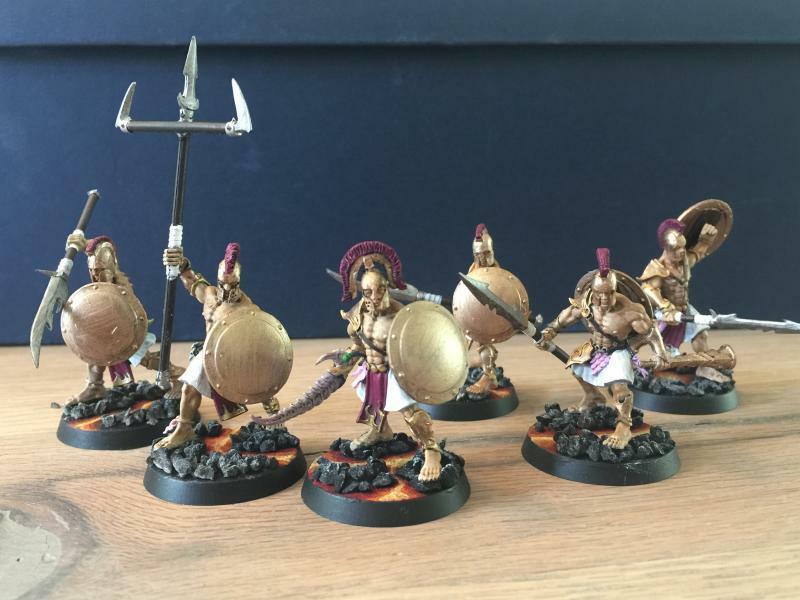 got me thinking about some of the best, let's say, non-box art themed armies out there. Ones either where the idea might be ludicrous but is so well executed it looks amazing or where someone's really explored a different aspect of a faction but it still totally makes 'in-universe' sense. Some ideas seem more obvious than others, like I didn't need to google it to know that there would be some stunning coral themed Sylvaneth out there (and oh boy are there) but what are the best alternative themes you've seen, you're thinking of, or indeed have already done? There's some incredible, and inventive, painters on this forum so interested to see what's cooking (mega bonus points if anyone's already done a Mexican Day of the Dead themed Skeleton army). My painting skills are weak as you like but I'm very slowly getting better and with that almost imperceptible improvement is also coming a hubristic desire to try something different. So I'm currently mulling over ruining some great models by attempting a Tzeentchian Herdstone done to look like it's made from crystal and an Eidolon of Mathlann, emerging from a tar pit with a viscous oil cloak and some tiny grease slicked fish and green stuff seagulls around the base. I’m trying to make a marine/pirate-themed Flesh-Eater Court, with blue-green skin, fire-coral red hair/claws, and sandy bases. We’ll see how well it works. I also wanted to make stone Sylvaneth (as in fossil plants), but the test model I painted didn’t look how I thought it would and kind of demoralized me, so I’m back to square one in that regard. I’d like to do feral freeguild and scourge-runner chariot themed corsairs. Money allowing id love to do FeC in the style of Dark souls. Where the delusion is weaker and so is the corruption. 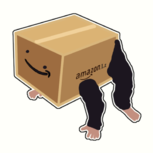 So these are in fact knights and kings of old but gone hollow with armor rusted and in tatters but in their mind they grasp resplendent bygone glories. 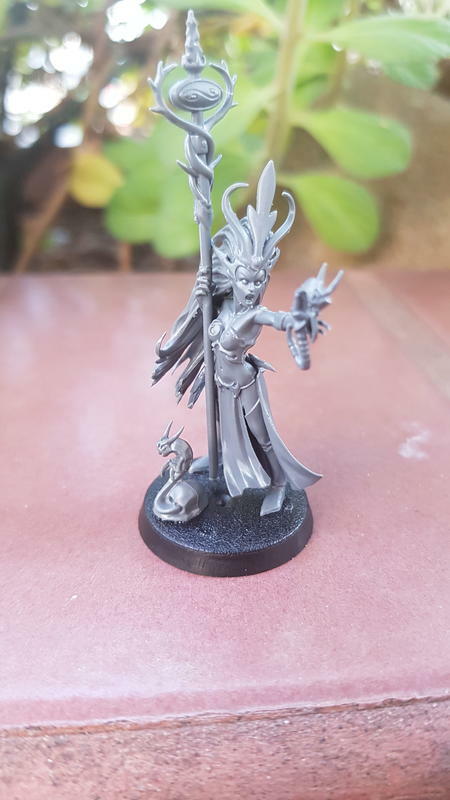 @IneptusAstartes fossilised Sylvaneth could be great if you could pull it off. I always think they’re one of the factions (alongside Nighthaunt) that is most amenable to being flipped and made different, whether modelling them to be heavily realm based or just going hard and into some other kind of flora (coral, cherry blossom, or please tell me there exists an Aqshy themed army with giant spiky Cactus Lords bestriding the parched field of war). Not saying the actual modelling, painting is easy just the ideas part, sadly. In the Soul Wars novel I’m pretty sure there’s references to undead Sylvaneth that got me thinking about some conversions. @Skoll sounds good, I had hoped we might have seen something like that when they re-did the battletome, or some kind of upgrade pack for the existing models. My idea was for a sprue with lots of dented, damaged and decayed armour and/or stuff like pots and pans that the delusional ghouls wear thinking it’s gleaming ancestral armour. I've been wondering what type of pants I should give my tyrant as my ironguts have striped pattern and my bulls are half sectioned, but I think chevrons would look kind of weird? and I don't want to do two stripes a side because then it looks like trackpants..
@BalborBullguts Oh man, I’d go hard on the tracksuit theme, 3 stripe Adidas sweatpants and a greenstuff hoodie FTW. The infamous Jogor clan, Tyrants of Track & Field, crushin’ skulls and personal bests, one mystery meat pie at a time. Slow burn hobby project but it's been fun to paint so far! @Lucio nowt wrong with by-the-box, and your red robes are a nice touch, I'm just finishing my Zarbag's Gitz this week actually and I had been thinking yellow robes but bottled it and went full trad with them in the end (I might re-do the Squig Herders helmet though and go big banana with it). Got a Squig Herd and box of Boingrot Bounders to tackle next though and fancy trying something different with them, but really at a loss of how to theme them. Will probably just go red squids with black robes again like a coward but might try brainstorming later and see if I can figure out anything not too hard that might give them some extra flavour. 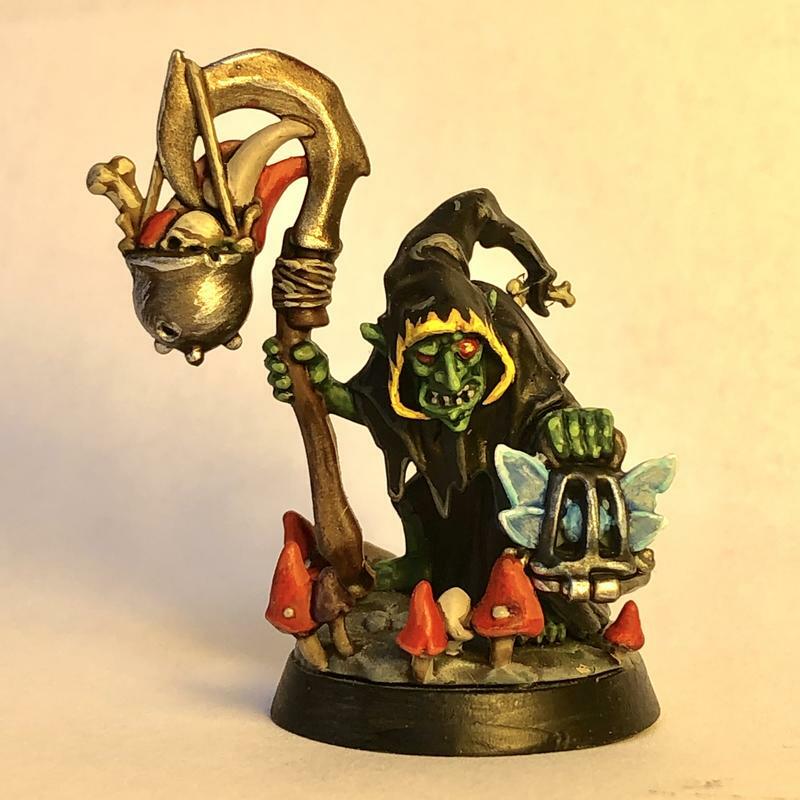 @Lucio nowt wrong with by-the-box, and your red robes are a nice touch, I'm just finishing my Zarbag's Gitz and I had been thinking yellow robes but bottled it and went full trad with them in the end (I might re-do the Squig Herders helmet though and go big banana with it). Get White Dwarf, each of the past 4 months has featured a realm and theme ideas for it. Imagine what would change if they lived in forests of Ghur, or the metallic realm of Chamon. I've got one very, very vague idea for my Squigs and that would be to do them as from Shyish. Paint them in a mix of deep dark purples and inky blacks, then make a little kind of skull stamp with a piece of sponge and use that to impress a white skull image on their faces, so it looks like it's been painted on by the Grotz themselves. Figure it would look much better on a big mangler squiggle but might try it with some little ones to see. Or, and this is probably well beyond me, paint them up in a kind of camo, with WWII RAF roundel designs painted on their flanks, bill them as the dreaded Gitfire Squadron. Would really need to model some flying goggles onto the riders then as well. Chamon is an easy one for this you can just paint flesh or clothing from any faction a metal color. I made a small project to make all 3 Wanderers heroes i wanted with spare parts, models i got and never used and bits. All gona be females, to make it more challenging. Got the SpellWeaver, now i am going to the Waywatcher and a Nomad Princess. A really dusty, sepia-toned Desert-themed Seraphon would be cool IMHO. I've only seen one or two such armies online. Lizards aren't just brightly colored things in the jungle (although amphibians would be kinda screwed in a desert). While most of my ideas tend to be conversion-based, one purely painting scheme-related idea I had was to paint orcs with ashen-grey skin and red-yellow warpaint mimicking lava streams wielding obsidian weapons. I thought it might be cool as an Aqshy-based army living near a volcano, but I'll likely never get around to actually trying it out. You can pretty much do "Fire + faction", "ice + faction", "desert + faction" (etc.) and it will nearly always be pretty cool. For example, Clan Volkn that use Clan Pestilens warscrolls/models, and the Plague Furnace would obviously be a big ball of fire. Not sure why it wouldn't burn down the wooden frame around it, but hey it's fantasy. Nice basing! though I see a few health & safety issues there, I'd be wearing at least a nice pair of sandals if I was spending the day noncing about on lava flows. 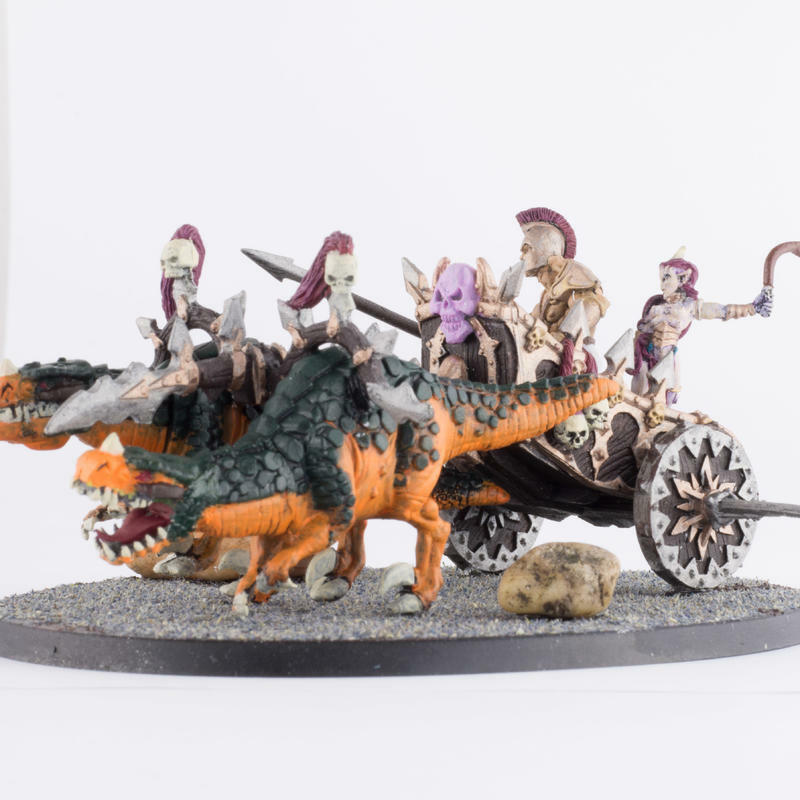 Also looking at that boulder placement on the chariot base it's got me thinking about what breakdown coverage is like in the Mortal Realms. They're going to be pissed off if they miss the big fight because they're stuck on the side of the road and can't get anyone out to fix their wheel. 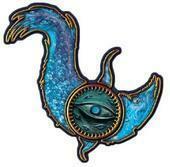 -Tzeentch would be fat, stupid warriors with heavy hammers and the like. Muted grey tones, maybe bird heads in naturalistic colors. Rusted pieces of armor, dented weapons. Unified theme Aelves for a mixed order army, back when I did my Fire Aelves its nice seeing how natural dark elf, wood elf and high elf kits look alongside each other when given a unifying colourscheme.